In video poker, knowing what to do with the most common hands separates the money-makers from the bankroll-wasters. There are a lot of tricky situations that players find themselves in all the time: Do I keep the suited King-Queen or my low pair? Do I keep my high pair or drop it for a chance at getting a flush? Not knowing what to do in these critical situations could cost you THOUSANDS of dollars over the long run. So read on and don’t make any of these common mistakes again! If you are dealt a video poker hand that puts you in more than one of the situations below, always play the one that is higher on the list. For example, always keep a Poor Pair over two money cards. Two Pair or Better: ALWAYS keep hands that are in the money. If you are dealt two pair or higher, don’t even think of drawing unnecessary cards. Some beginning players think they should break up a straight to go for a flush. DON’T DO IT! This is like someone giving you $5 and you turning down the free cash for a better offer. Take the money and run! Money Pair: Typical Money Pairs are Jacks or better or Queens or better (see the rules of the video poker game you are playing to find out what the lowest Money Pair is). These are called “Money Pairs” because when you have one of these pairs, you are already making money on the hand. As was said above, there are very few situations where you would want to break up a pair to draw for a different hand. As a rule of thumb, always keep a Money Pair when you are dealt one. Poor Pair:Any pair that is not a Money Pair (see above) is considered a “Poor Pair” because this pair alone will not get you any money. However, having a Poor Pair going into the draw often leads to bigger hands such as 3 of a kind, 2 pair, and sometimes even full houses and 4 of a kinds. While these won’t make you money by themselves, they open up lots of possibilities for you on the draw. Two Money Cards: Money cards are single cards that when paired create Money Pairs. As was said above, money cards are typically either jacks or better or queens or better. If you have a two or more money cards that don’t make a pair (EG a Jack and an Ace), keep the two lowest money cards going into the draw. Keeping 2 of them creates a greater opportunity for at least one of them to make a pair and also sets you up for a straight. If you have the option to keep 2 suited money cards, always keep them to increase your chances of getting a flush. One Money Card: If you are dealt one money card, ALWAYS keep it going into the draw. Holding this one money card increases your chances of getting at least a Money Pair. 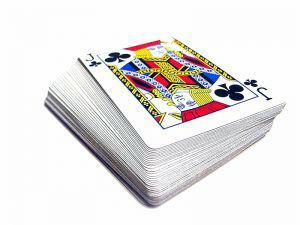 No Money Cards: If you are dealt no money cards at all, it’s time to dump all of your cards and draw new ones. There is no advantage to keeping any cards that are out of the money unless you are close to a flush or straight. As a gernal rule, if all of your cards are out of the money and you are more than 2 cards away from a straight or a flush, dump them all and draw new ones. If you liked this article you may also like other video poker strategies such as video poker winning decisions, video poker tips for beginners, the best video poker odds, and using video poker bonus codes. What kind of video poker strategy articles would you like to see? Ask and you shall receive! Let me know in the comment section below!